This is a tour exploring the entire Gansu province, from the famous Jiayuguan Pass - Western end of the Great Wall, Dunhuang - home to the Mogao Grottos, one of the richest collections of ancient Buddhist murals and statues in China, to Xiahe of Gannan area (south Gansu), which is known for its rich Tibetan culture, landscape and Labrang & Langmu Monasteries - quiet and picturesque paradise. * explore murals and statues in the grottos on high cliff. * Mount on the fort of the western end of the Great Wall. 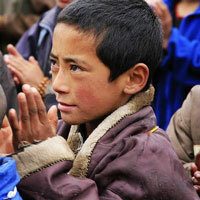 * Visit the most important Tibetan monastery out of Tibet. CCC does not presently offer regular set excursions to this destination. However we are happy to help you plan a private tour. Please click the tab "Custom Itinerary" to check prices and propose a date and your own group. Jiayu Mountain is located in Gansu's north, close to Inner Mongolia and Qinghai province. 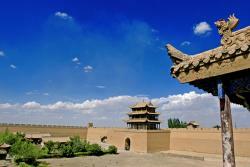 At the foot of the Jiayu Mountain lies Jiayuguan, one of the greatest ancient forts on the Silk Road. The Fort was founded during the Ming Dynasty, built to an existing watchtower and completed in 1372. It was the western end of the Great Wall and for the Chinese the last outpost of civilization, beyond which lay barbarian country. The Fort is also known as “Impregnable Defile under the Heaven” and has been crowned as the best in China due to its bleak location. Along the Hexi Corridor and 43 miles southwest to Dunhuang City in Gansu Province, Yangguan Pass is one of the two important western passes (the other one is Yumenguan Pass) of Great Wall in Western Han Dynasty (206BC -24AD). The Emperor Wu ordered to build it in the purpose of consolidating the frontier defense as well as developing the remote western region. For years and years, the flowing dunes have eroded this Great Wall pass into a broken beacon tower, standing alone in the boundless desert. It measures 15.4 feet high and 8.7 yards wide. Around the relic, you cannot even see the dismantled walls, because they were all eroded by the wind and buried under earth. South to the pass, there is a "Curio Beach". It is a small valley where you can find lots of dynasties' tiles, coins, weapons, and decorations. Dunhuang, "City of the Sands", is located in Gansu, northwest of China. It was a former terminal of the ancient Silk Road, perched on the edge of the Taklamakan Desert, one of the world's largest deserts (272,000 sq km). Dunhuang is home to the Mogao Grottos, one of the richest collections of ancient Buddhist murals and statues in China. These grottos were carved into a 1600-meter high cliff and created during over nine dynasties (4th - 14th centuries). They contain 492 caves, each housing murals (45,000), Buddhist paintings and terra-cotta statues (2,000). At the "Mingshashan Sand Dunes" -which Marco Polo referred to as the "rumbling sands"- one can visit "Crescent Moon Lake", a lush green oasis. A stunning view of a green oasis surrounded by endless desert scenery will open to you when climbing to the top of the dunes. 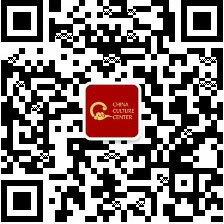 Other locales: Let us know your departing city and we will arrange your journey to Jiayuguan. After lunch, we will start the tour by visiting the Jiayuguan Pass. 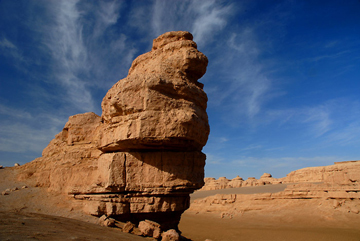 Jiayuguan Pass is situated in the middle of a narrow valley. The Great Wall on both sides of the pass crosses the Gobi desert, with the Overhanging Great Wall to the north and the First Fire Tower of the Great Wall to its south. The Jiayuguan Pass represents the western starting point of a section of the Great Wall constructed during the Ming Dynasty (1368-1644). Then, we will drive to the overhanging Great wall neighboring the Pass. The Overhanging Great Wall is an important part of the defensive work of Jiayuguan Pass. It is built in the year of 1539 during the Ming Dynasty. The main body of the Overhanging Great Wall was built with gravel and soil, including three fire towers. Have dinner and check in to hotel. After breakfast, we will check out of our hotel and drive 4.5 hours to Dunhuang. We will make flexible stops on the way to enjoy the vast wilderness of the Gobi desert. 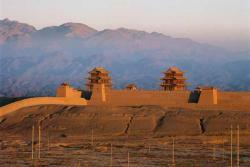 Dunhuang, "City of the Sands", is located in Gansu, northwest of China. It was a former terminal of the ancient Silk Road, perched on the edge of the Taklamakan Desert. 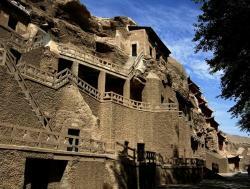 Dunhuang is home to the Mogao Grottos. Upon arrival, we head straight to the Mogao Grottos, one of the richest collections of ancient Buddhist murals and statues in China. These grottos were carved into a 1600-meter high cliff and created during over nine dynasties (4th - 14th centuries). 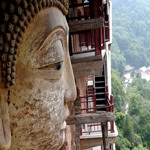 They contain 492 caves, each housing murals (45,000), Buddhist paintings and terra-cotta statues (2,000). Have dinner and check in to hotel. In the morning, we will have great fun in Mingshashan Mountain and Sand Dunes, which Marco Polo referred to as the "rumbling sands" and ride camels on the Sand Dunes leading to the Crescent Moon Lake - a lush green oasis. A stunning view of a green oasis surrounded by endless desert scenery will open to you when climbing to the top of the dunes. After lunch, we drive for about an hour to visit Yangguan Fortress. 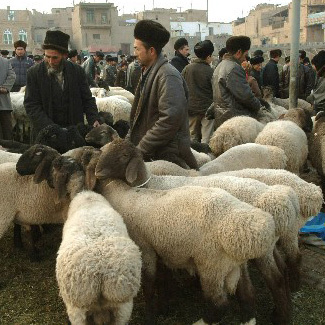 Then, we will transfer to the airport and fly to Lanzhou, the provincial capital of Gansu province. GS7564 (16:55~18:55). Have dinner and check in to hotel. Have breakfast and check out the hotel. We will drive for about 4 hours to Xiahe. 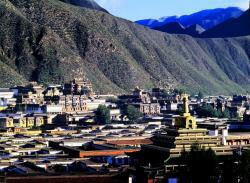 Xiahe boasts wonderful landscape and mysterious religion culture. Unique Tibetan customs and beautiful prairies give the place the good names of ‘Chinese Little Tibet' and 'Eastern Vatican'. Upon arrival, we will visit the stunning Labrang Monastery. Check out and Drive to Lanzhou. Along the way, we will visit the great mosque in Linxia County..